Other than bunch of useless applications that you can disable (see my previous post here), I found that you can also disable animations in your Android phone. I feel that this make your phone runs even faster! [Update: 03 August 2014]: Apparently the latest 4.2 Android update has disabled "Developer options" but you still can enable it by going to "About device" and click on the "Build number" multiple times. Sounds cool definitely from a developer perspective! Turn OFF all animations (i.e. 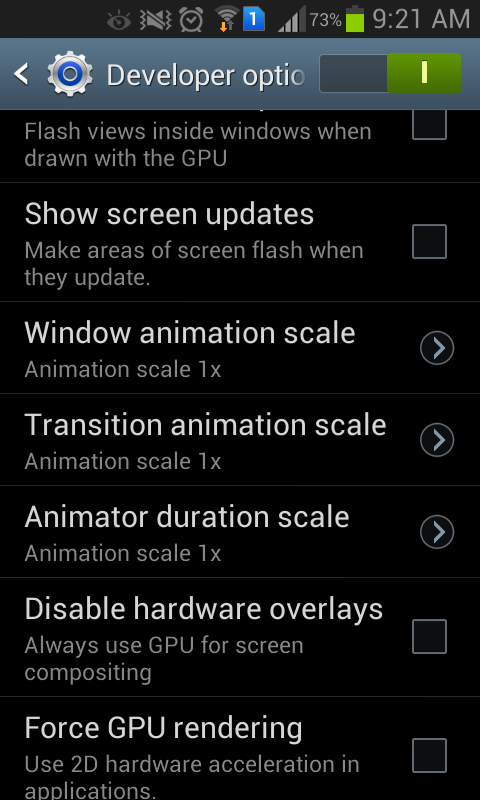 Window animation scale, Transition animation scale and Animator duration scale). The default is scale X1, you just need to turn it off. Antivirus application is important to your android mobile especially if you intent to install applications that from unknown source. Yes, I do sometimes. Similarly to desktop application, I have been trying it out the AVG antivirus for Android. So far, it doesn't catch any virus at all. So I"m wondering if virus exists in Android? Maybe no? But one thing good is it manages to catch applications that have Adware which I hate most. It will be pop up the following once detected during the application install. You can either choose to Ignore or Uninstall it. Yes, "Friends with Benefits" has Adware. Don't simply get benefits from friends! lol. I think they just do this recently because I"m getting more this kind of warning while trying to install applications (especially games) from GooglePlay and previously I rarely get any warning. Personally, I think it is better to have an Anti-virus app in your mobile especially on open platform like Android. Still, sensitive information should not be stored in phone in my opinion. Assume the worst case that your phone gets stolen one day, your most important data still safe. It is called "Antivirus Security - Free", you can download it here. Safe Web Surfing - Useless and it makes your browsing slower. Deep File Scann - Perhaps just do it first time will be enough. Scan Text Messages - Can SMS do anything harm? I have no idea. I only enable the "Enable PUP Detection" which I think is useful to detect any malware or adware during application install. This Antivirus also gives warning on your android settings if it allows unknown source and USB debugging (for Android development). I need both of them, thus I just ignore those threats. P/S: By the way, the best here is just personal preference. 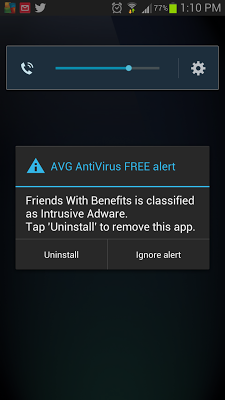 I assume either you can use AVG or AVAST (which I haven't tried yet) will do for FREE and BEST antivirus application in Android.